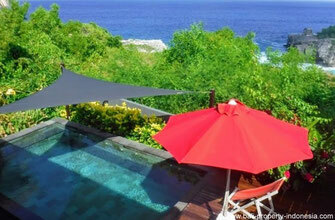 On this page you will find a directory of our properties on offer for sale at Nusa Penida, Nusa Ceningan & Nusa Lembongan. To go to the page of the property of your interests, please click on the pictures of that certain property or click on the button that says “More information”. This wooden villa is located in Ceningan Island and has been built almost on the cliff.